We have no love for Donald Trump. Rude, crass, xenophobic, misogynistic are just a few words to describe him. He is a danger to the environment and a complete loose cannon on the world stage. It’s certainly going to be an ‘entertaining’ presidency. 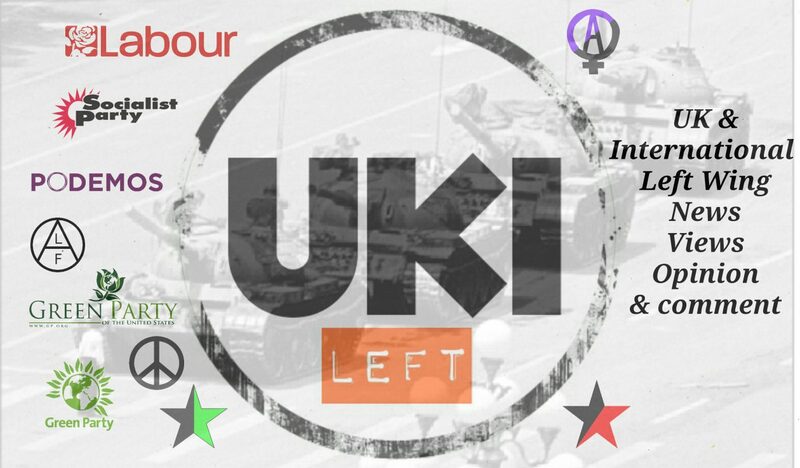 When it was announced that Donald Trump would be having a state visit the total panic and anger of UK citizens was palpable, certainly amongst many on the left, so much so that over 100,000 people protested in London alone in an international show of support against Donald Trump. Is it all really justified though? We have been no stranger to criticising our own left side for hyping up the fear levels. He is after all no more of a danger on the international scene than say George Bush Jr. The epitome of a Neocon hell bent on destroying the Middle East. If anything he is more of a danger to the environment and his own people than anything else. 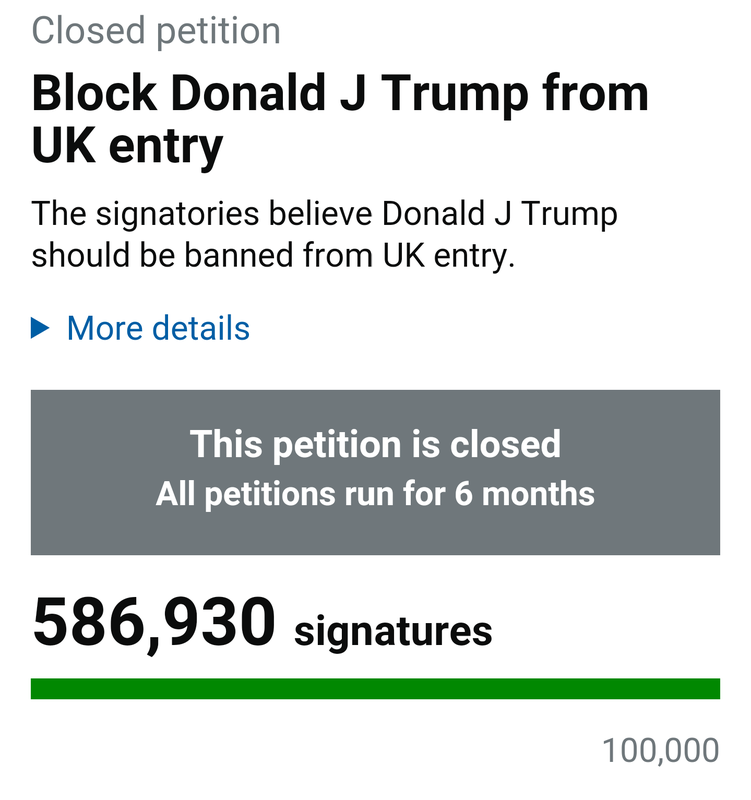 So we decided to see how much of a threat Trump has been to the people of the UK by looking at how many people have signed petitions in support of a few various causes, including some of the largest ever petitions to government. It may put some things into perspective. 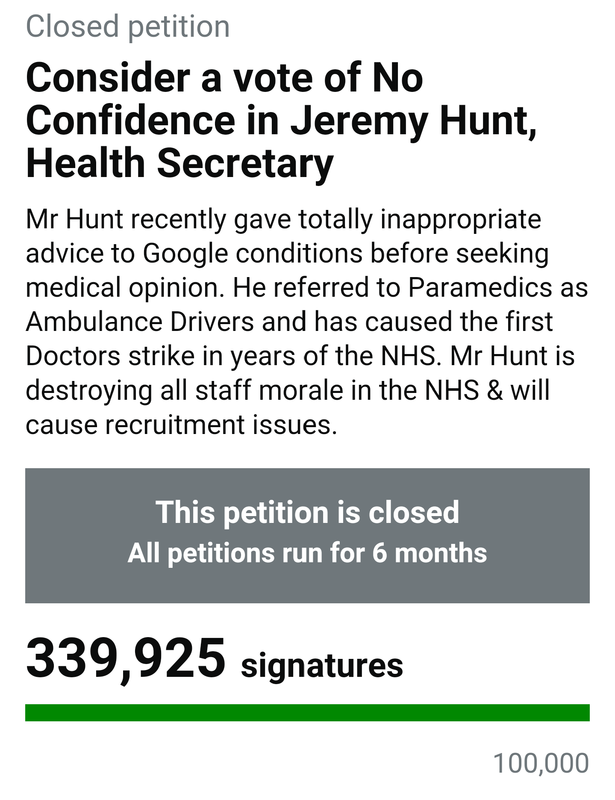 Even the NHS, with all its problems couldn’t get anywhere near the level of support the Donald Trump petition achieved. 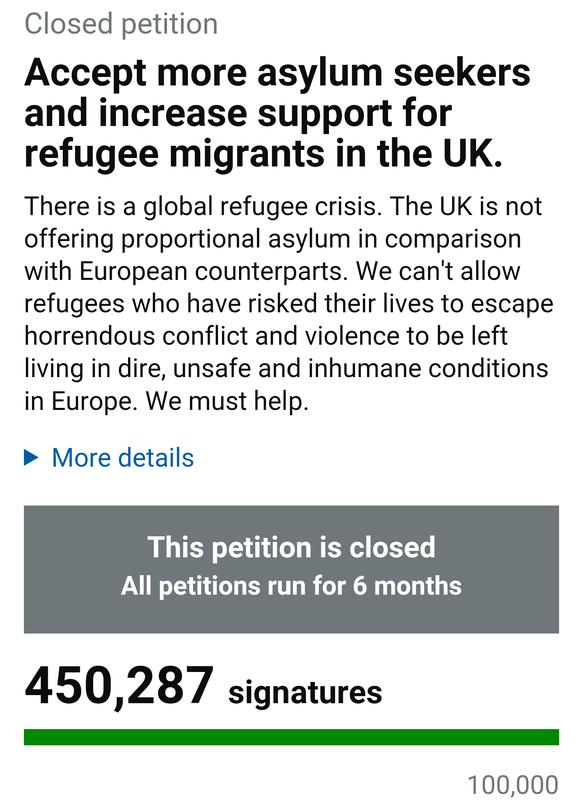 There was then this first Donald Trump petition to stop him coming to the UK at all. 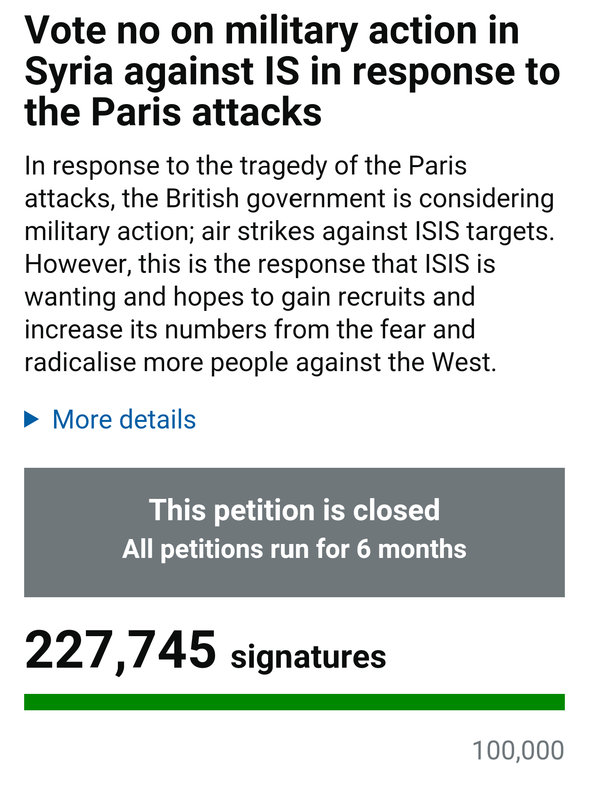 Big enough in itself at over half a million signatures. 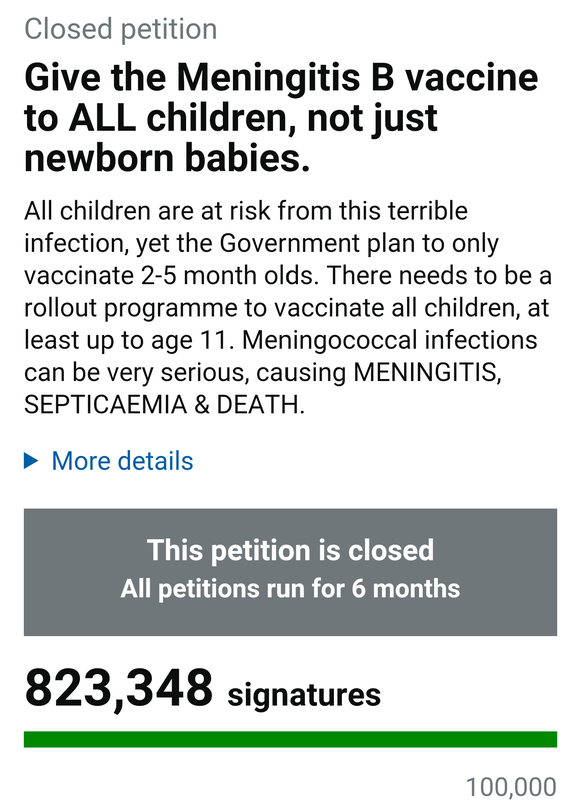 Thankfully there was some respite from the insanity as over 800,000 people signed a petition to give all new borns a vaccine against a form of Meningitis. But that was shattered by a colossal petition which puts everything in the shade. 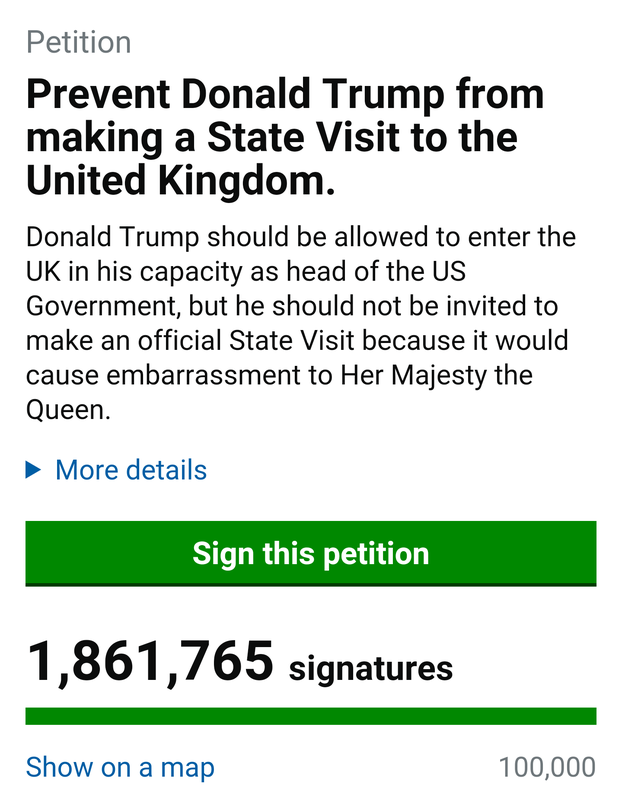 At almost 2 Million signatures, a petition to stop the state visit of Donald Trump to the UK. 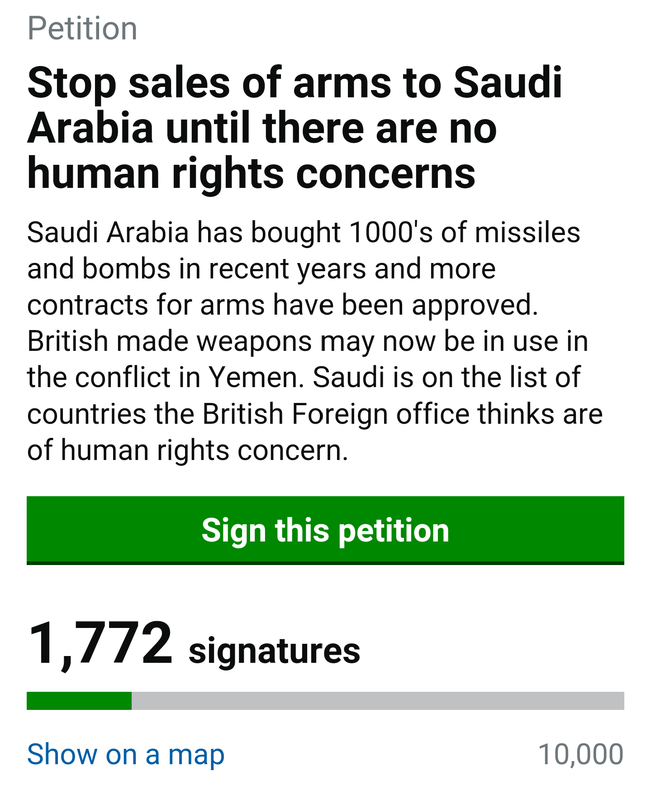 The two Donald Trump petitions combined means that of the petitions shown here Donald Trump has attracted in the region of 400,000 more signatures than the other 8 petitions put together including War, child abuse, the NHS and benefit cuts to the most vulnerable in society. 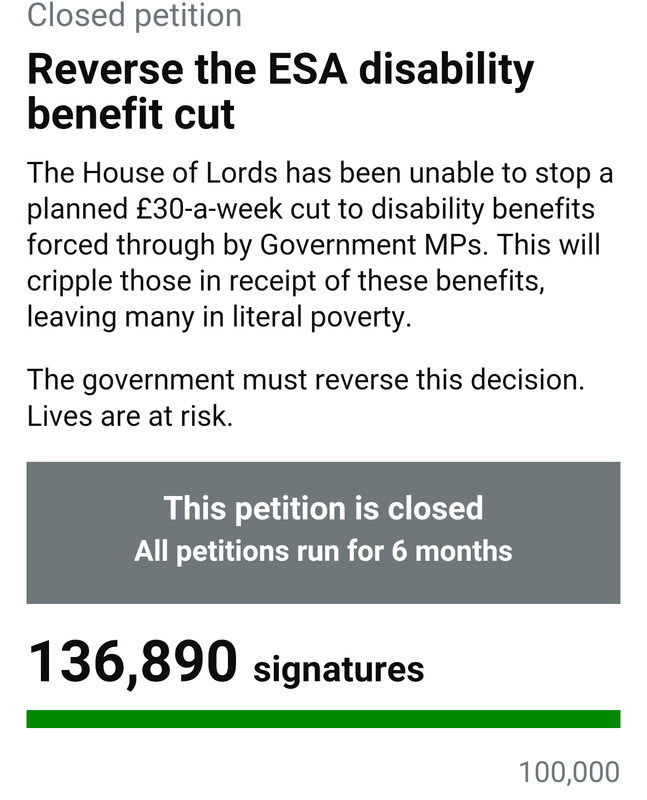 We realise this is not scientific and doesn’t take into account perhaps other signature based petition websites or individual circumstances such as how widely a petition was shared but it does give us an idea of perhaps how skewed our sense of outrage is. This is why we refuse to get too hung up on Donald Trump. Before we know it, he will be gone, only to be replaced by a new Neocon and the battle for the Middle East will likely commence again, and besides, our NHS is far more important than Mr.Trump. Perhaps if we focused more on our own problems we might do better at getting the message across to the wider public about how this Conservative government is ruining people’s lives. 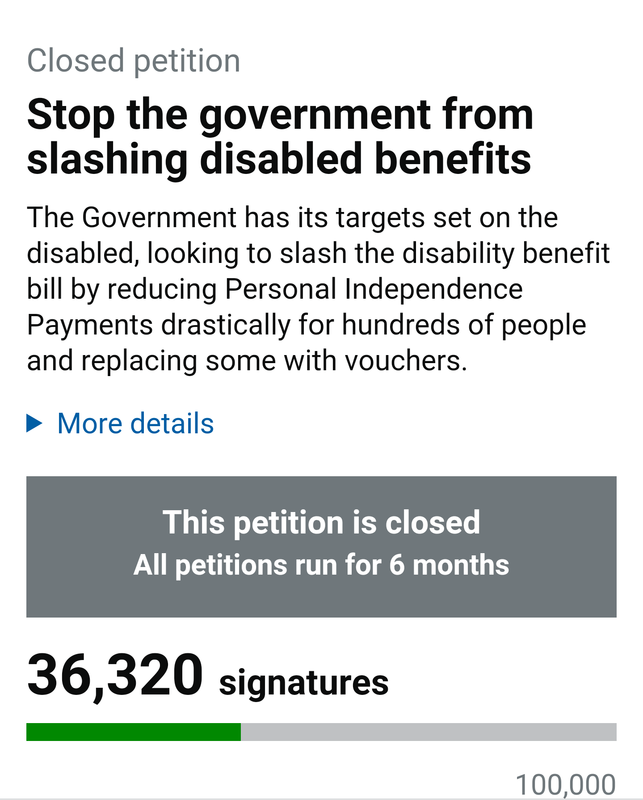 You can view a list of the largest ever government petitions that have been signed here. Would it be OK if I cross-posted this ar5ticle to WriterBeat.com? There is no fee; I’m simply trying to add more content diversity for our community. I’ll be sure to give you complete credit as the author. If “OK” please let me know via email. Stranger Fruit: Does New Michael Brown video change anything?